In Mumbai, a multitude of different urban fabrics collide with each other and with ecology. 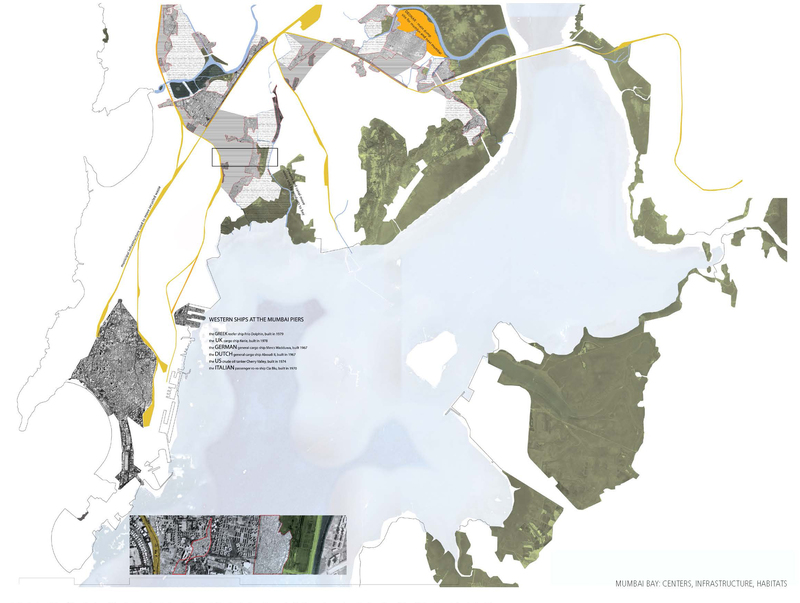 Particularly relevant is the mixing of the informal settlements with the fragile environment of mangroves and creeks. The condition repeats itself numerous times in Mumbai, and if current development continues, the same will be true for Navi Mumbai. It is, thereby, a condition that must be studied, understood, directed and mitigated. Mahul Creek is centrally located in Mumbai’s bay from a geographic perspective, although it is not included in the public transportation network. The area exhibits an extreme condition of adjacencies between heavy industry, various types of formal fabric, villages and informal settlements. The site serves as a strategic location for the IIHS to study the emblematic condition of the city, thereby furthering the education and impact of urban practice. The squatter fabric threatens further encroachment on the already polluted creek and mangroves. The project addresses the condition in two ways. First, the city grid continues through the informal settlements across the creek to recent development, including high-end residential towers and an IMAX theatre complex. The connective paths occur mainly at primary circulation routes that feedback to the public rail transportation system. 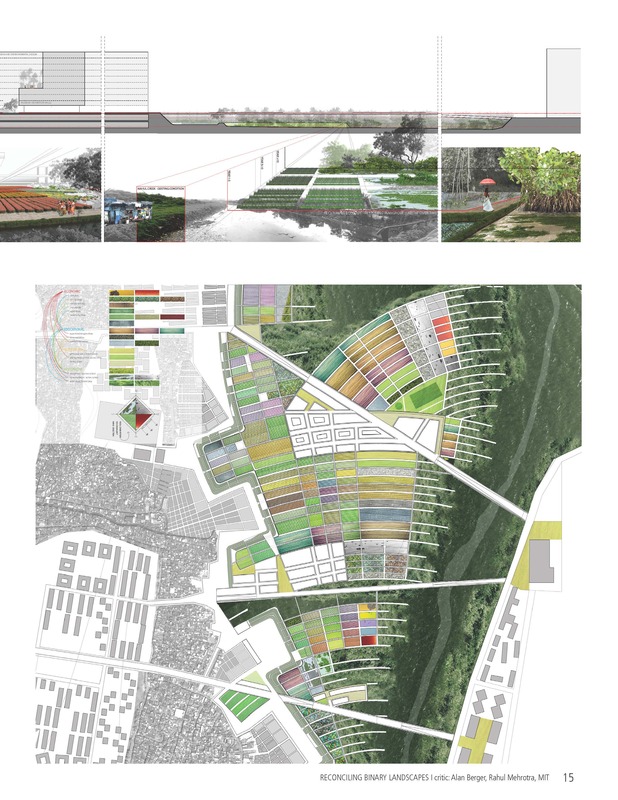 These paths minimally cut through the informal fabric in zones where adjacent land can be allocated for resettlements. 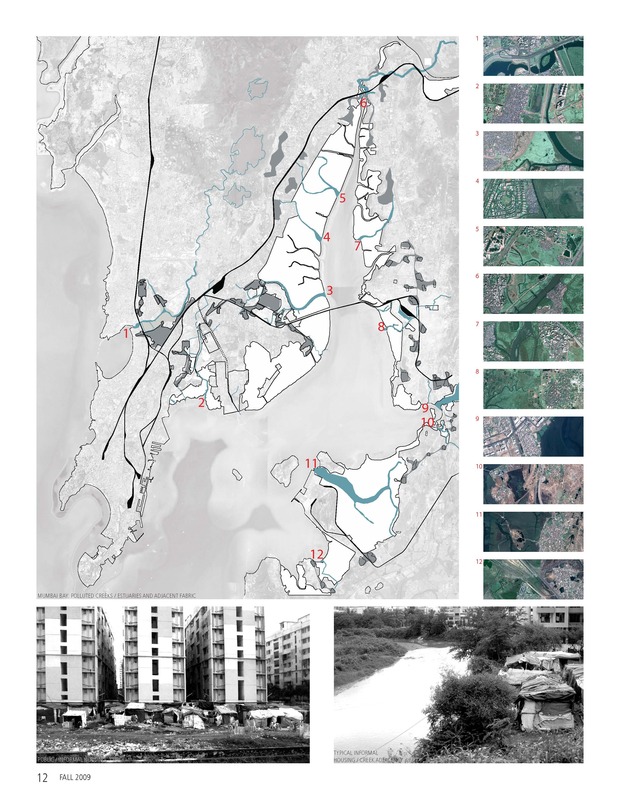 Secondly, the project proposes a landscape interface between the squatter settlements and the creek. Where the city fabric is informal, a productive landscape will provide social and economic development for the squatters. This interface acts as a buffer that mitigates waste effluences from the community and provides spaces for economic development programmed as laundry facilities, agriculture and aquaculture zones. The form of the landscape is derived from pivot irrigation needed to mitigate the polluted creek water for productive uses. The current road running along the creek will be removed as it creates a harsh barrier hindering mangroves and the cross circulation between the two sides. 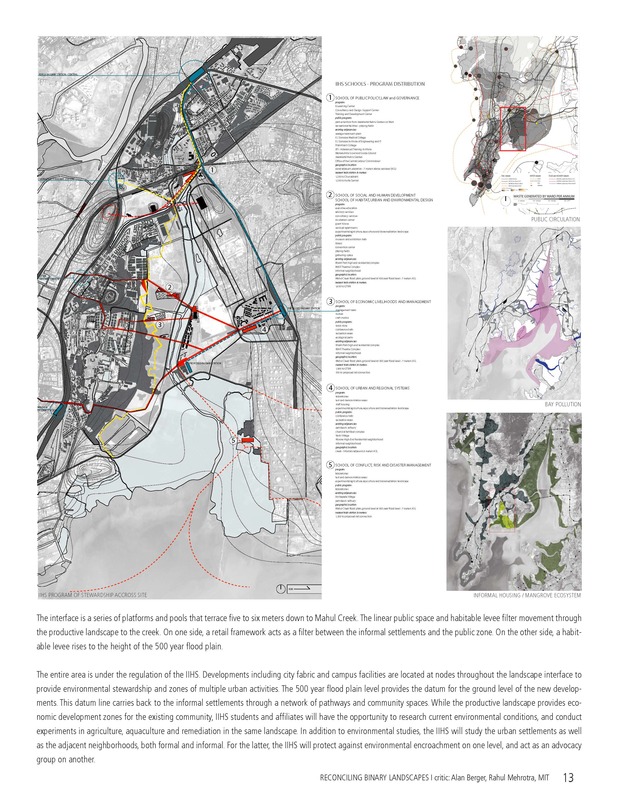 A new circulation link is introduced between the informal settlements and the productive landscape. The linear public space contracts and expands with the social and programmatic needs of each area. The interface is a series of platforms and pools that terrace five to six meters down to Mahul Creek. The linear public space and habitable levee filter movement through the productive landscape to the creek. On one side, a retail framework acts as a filter between the informal settlements and the public zone. On the other side, a habitable levee rises to the height of the 500 year flood plain. The entire area is under the regulation of the IIHS. Developments including city fabric and campus facilities are located at nodes throughout the landscape interface to provide environmental stewardship and zones of multiple urban activities. The 500 year flood plain level provides the datum for the ground level of the new developments. 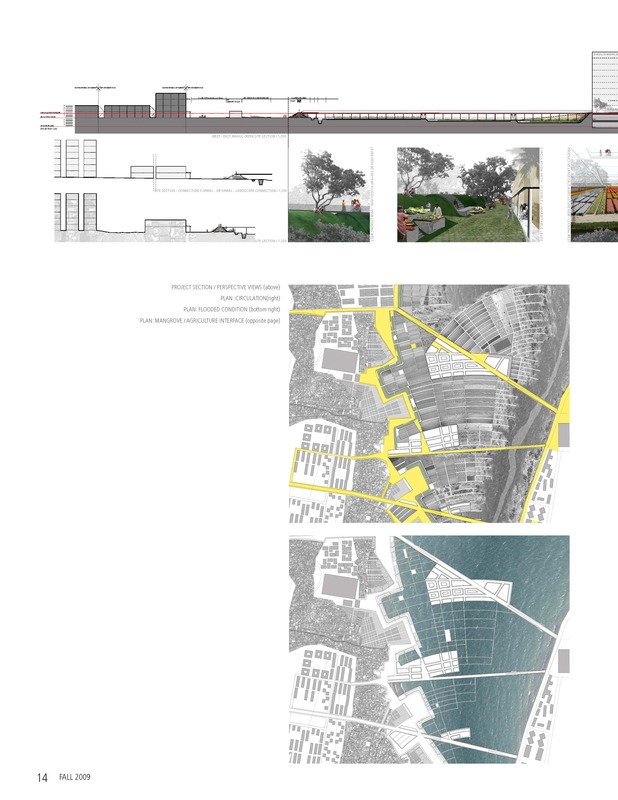 This datum line carries back to the informal settlements through a network of pathways and community spaces. While the productive landscape provides economic development zones for the existing community, IIHS students and affiliates will have the opportunity to research current environmental conditions, and conduct experiments in agriculture, aquaculture and remediation in the same landscape. In addition to environmental studies, the IIHS will study the urban settlements as well as the adjacent neighborhoods, both formal and informal. For the latter, the IIHS will protect against environmental encroachment on one level, and act as an advocacy group on another.